Urban Initiatives Team Captains were back in action this past weekend. 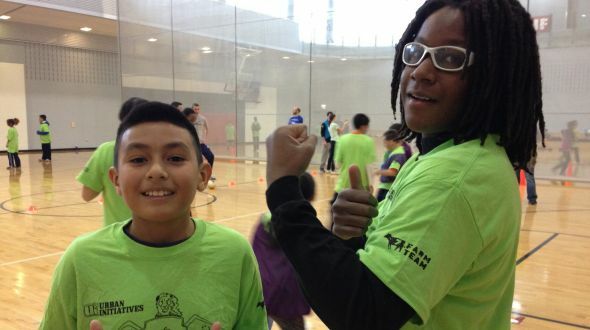 Captains from schools across the city gathered at the University of Illinois at Chicago to partake in a fun filled morning of leadership activities, discussions, and a soccer tournament. The kids spent the morning of this Take the Lead Retreat focusing on the importance of physical activity. These Team Captains were quick to notice that while physical activity can be a lot of work, it can also be a great time! Knowing the importance of physical activity is one thing. Being able to ensure others are receiving the appropriate amount of physical activity while also having fun is another thing. The Team Captains took it to the next level. After being separated in to small groups the Captains were able to brainstorm fun ways to stay active, and then teach another group one of those games. The afternoon of this Take the Lead Retreat was spent back at the Urban Initiatives office, where the focus was changed to service projects. The Captains learned about the history of UI and how one small example of giving back to the community can grow to a program serving over 11,000 Chicago youth. The Team Captains were then informed that they would be partaking in a service project in their communities. But there was a catch. To learn more about the service projects the Captains were separated in to groups for a scavenger hunt. In order to learn about the available projects they would have to work as a team to find the informative stations set up throughout the building. By demonstrating amazing teamwork, each group was able to reach their goal and learn about the possible projects they would be bringing to their communities. In the upcoming months the Team Captains from each school will brainstorm and discuss which project best fits the needs of their community, and how they will implement the projects. Urban Initiatives would like to thank UIC for hosting the Team Captains. We would also like to thank Gourmet Gorilla for a great lunch, and all of the amazing volunteers that came out and supported our Captains. You are the best!